- Our popular three roll mill models feature roll sizes of 2.5x5, 6x12, and 9x20 in inches. We manufacture and export an optimal quality range of Triple Roller Mills that are specifically designed for ointments, paints and inks. To fulfill the assorted requirements of our clients in the best possible and trusted manner we are passionately engaged in offering a wide range of Triple Roll Milling Machine. 3 X 8: 1 HP.440 V.
4 X 12: 2 HP.440 V.
6 X 15: 5 HP.440 V.
TRIPLE ROLLER MILL : WITH CROMPTON MOTOR Consists of S.S. 304 quality roller. Unit fitted with motor, chain driven oil immersed gear box heavy duty M.S. construction. All contact parts of S.S.
Throughput- Min- Max. : 0.02 -2 Liter/Hour, Average depending on product. 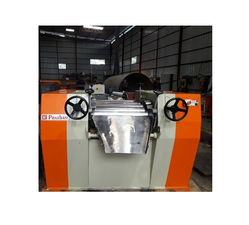 We manufacture "Triple Roll Mill Machine" which is used in Detergent cake industries and Toilet Soap industries for preparing chips. It is used to provide fineness and homogeneity to the product. It is fabricated in mild steel with special alloy chilled rolls. We are a unique entity in this industry, actively committed towards manufacturing a premium quality range of Tripple Roller Mill. 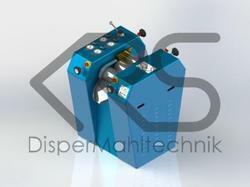 We have designed and developed Triple Roll Mills for industries involved in production of fine grinding of pastes. This includes water based and solvent based screen inks, metal decoration inks, web offset inks and others that can be available with best consistency.